INTRODUCTION: Tibial plateau fractures in the elderly pose significant treatment challenges because of coexisting medical problems, pre-existing degenerative joint disease and osteoporosis. While several studies have reported promising results with the use of circular external fixation, little data is available on its use in older patients. This study aims to compare the complications and union rate of circular external fixation in patients over the age of 55 years with that achieved in younger patients. MATERIALS AND METHODS: We retrospectively reviewed all patients treated with circular external fixation over a six-year period. Patients were divided in two groups: Group 1 consisted of patients under the age of 55 years and Group 2 of patients 55 years and older. Group 1 consisted of 63 cases (mean age 37.2 ± 9.1 years and Group 2 of 16 cases (mean age 60.2 ± 5.8 years). Apart from the patient age, there was no significant difference between the two groups in terms of demographics, mechanism of injury (p-value = 0.9) or the prevalence of polytrauma (p=1.0). RESULTS: At a mean follow-up of 19 ± 6.2 months all but two of the fractures had united. The mean overall duration of external fixation was 20.2 ± 8.2 weeks, with a slightly longer mean time-in-frame in Group 1 (20.9 ± 1.1 weeks) in comparison to Group 2 (17.8 ± 1.4 weeks, p=0.1). Complications occurred more frequently in patients over the age of 55 years (56% vs 37%, p-value = 0.2). Loss of reduction also occurred more frequently in patients over 55 years (19%), compared to patients younger than 55 years (6%) (p=0.1). CONCLUSION: Circular external fixation may be a viable treatment option in patients over the age 55 years who sustain high-energy tibial plateau fractures associated with significant soft tissue compromise. No significant difference was found in terms of the union rate or the development of complications when compared to younger patients. 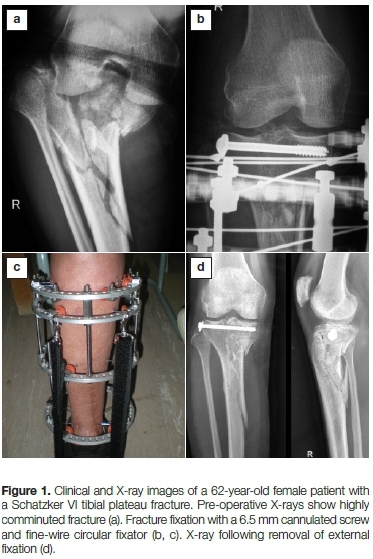 While several studies have reported promising results with the use of circular external fixation, little data is available on its use in the elderly.1,2,8 In the elderly hybrid external fixation has been reported to deliver inferior results in comparison to internal fixation.9 This study aims to compare the complication and union rate of conventional circular external fixation in patients over the age of 55 years with that achieved in younger patients. Ethical approval was obtained from our institution's ethics review board prior to commencement of the study. Post-operative rehabilitation commenced on day 1 after definitive fixation. Early knee range of motion exercises was followed by weight bearing as pain allowed. Pin site dressings were left undisturbed for the first seven days following the procedure. After this period, the dressings were removed and twice daily pin site cleaning, with chlorhexidine-alcohol solution, were commenced. Initially all patients were followed up at two-weekly intervals at our outpatient department. The intervals were extended to four-weekly once a robust rehabilitation programme and pin tract care regimen was established. Particular attention was paid to weight bearing mobilisation, functional rehabilitation and normalisation of gait pattern in order to promote recovery and bony union. Follow-up radiographs, the progress with rehabilitation and the occurrence of any complications were documented at each clinic visit. Union was considered as the presence of combination of fracture consolidation in at least three cortices and painless weight bearing. Malunion was defined as radiographic angulation of more than 10 degrees in any plane. Statistical analysis was performed using Stata 13.0 (StataCorp. College Station, Texas). Continuous variables were reported as mean (± SD) or median (with interquartile range) and categorical variables as number and percentages, unless otherwise stated. Differences in continuous variables were compared with the use of the unpaired t-test. The chi-square test was used for categorical data. All tests were two-sided, and the level of significance was set at p<0.05. For the purposes of optimal sample size calculation, a power of 80% was selected. We identified 84 fractures, in 80 patients, that were treated by circular external fixation from the prospectively kept database. Five patients were excluded from the study. Four cases had less than 12 months' follow-up and one patient was lost to follow-up (Figure 2). Seventy-nine patients, with a mean follow-up of 19.4 ± 6.2 months, were included in the analysis. The mean age was 41.8 years (range 21-73 years). The demographic and clinical characteristics of the two groups are provided in Table I. 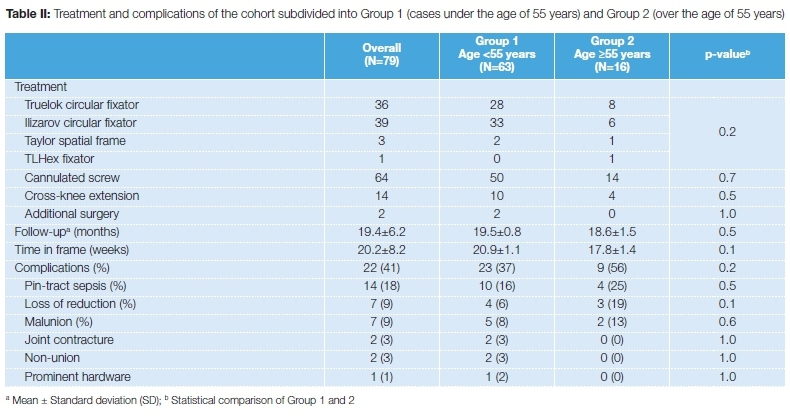 Group 1 consisted of 63 cases below the age of 55 years (mean age 37.2 ± 9.1 years) and Group 2 of 16 cases that were 55 years or older (mean age 60.2 ± 5.8 years). Apart from the patient age, there was no significant difference between the two groups in term of demographics, mechanism of injury (p-value = 0.9) or the prevalence of polytrauma (p=1.0). The majority of fractures (58%) were sustained in road traffic accidents and 29% of all patients sustained multiple injuries. Notably, 18 patients were found to be HIV positive (Group 1=17 and Group 2=1, p=0.1) with a mean CD4 count of 389 cells/mm3. Furthermore, 22% of patients in Group 1 were cigarette smokers compared to none in Group 2 (p-value = 0.06). Overall, 88% of fractures were classified as bicondylar in nature (Schatzker V or VI) and there was no significant difference in the classification of the fracture type between the two groups (p=0.4). The majority of fractures, 70% in Group 1 and 88% in Group 2, were classified as Schatzker type VI fractures. Few fractures were unicondylar in nature, 7% and 6% in Group 1 and 2 respectively. Significant soft tissue injury (Tscherne class > 2) was present in the 69% of cases in Group 1 and 87% of cases in Group 2 (p-value = 0.5). 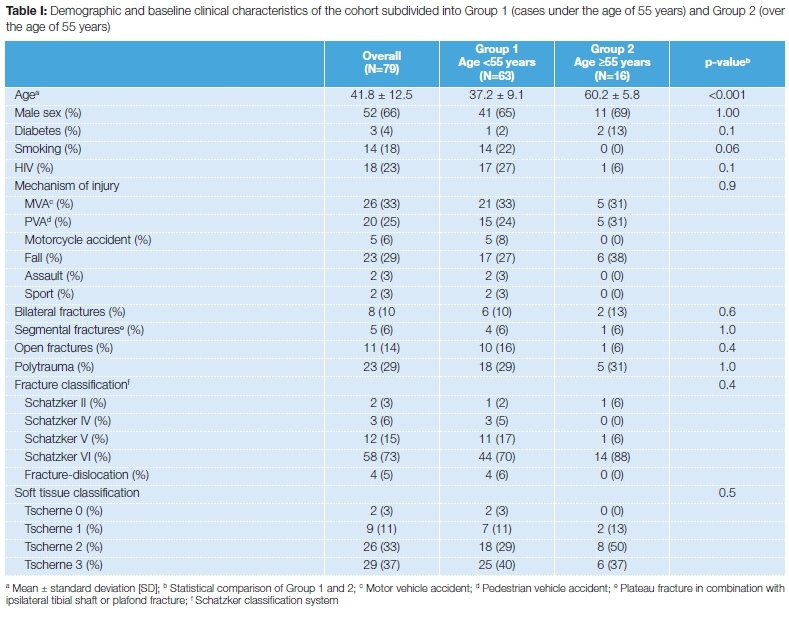 Fourteen per cent of all fractures were classified as open (Group 1=16% and Group 2=6%, p=0.4). At a mean follow-up of 19 months (standard deviation [SD] = 6.2) all but two of the fractures had united. The mean overall duration of external fixation was 20.2 ± 8.2 weeks, with a slighter longer mean time-in-frame in Group 1 (20.9 ± 1.1 weeks) in comparison to Group 2 (17.8 ± 1.4 weeks, p=0.1). There was no significant difference in the type of fixator used (p=0.2), the addition of cannulated screw fixation (p=0.7) or the need for cross-knee extension of the external fixator (p=0.5) (Table II). Three patients in Group 1, compared to none in Group 2, required an additional surgical procedure. In one patient, with a delayed union, a fibula osteotomy was performed which resulted in successful union. Bone graft and locked plate fixation was performed in the second patient for a non-union of a highly comminuted fracture. An iliac crest bone graft procedure was performed in the final patient who sustained a Gustilo-Anderson grade IIIB open fracture. Despite the autogenous bone graft a non-union occurred, at the meta-diaphyseal component of the fracture, in this patient. Complications occurred more frequently in patients over the age of 55 years (56% vs 37%, p-value = 0.2). Overall, pin-tract sepsis was the most common complication encountered (18%) and there was no significant difference between the two groups (p=0.5). Loss of reduction occurred more frequently in patients over 55 years (19%), compared to patients younger than 55 years (6%) (p=0.1). Malunion occurred in 13% of patient in Group 2 compared to 8% in Group 1 (p=0.6). Joint contracture, non-union and prominent hardware occurred infrequently, and only in patients under the age of 55 years. None of the patients required total knee replacement during the follow-up period. The aim of this study was to compare the complication and union rate of tibial plateau fractures treated by circular external fixation in patients older than 55 years with that achieved in younger patients. 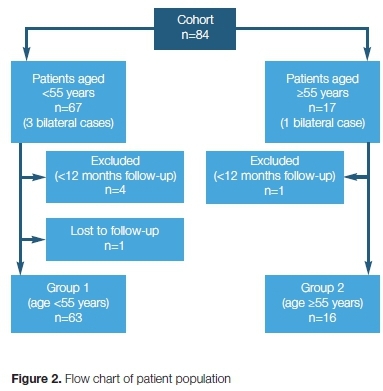 While we would like to believe that a 55-year-old person should not be classified as elderly, we used this figure as it is in line with previously published reports.9,20 No significant difference was found in terms of the union rate or the development of complications. The duration of external fixation was marginally shorter in patients over the age of 55 years. While loss of reduction and malunion was encountered more frequently in patients over the age of 55 years, the difference was not statistically significant. It should however be noted that the cohort comprised mainly cases with high-energy fracture patterns and/or a compromised soft-tissue envelope. In fact, 88% of patients older than 55 years had Schatzker type IV fractures. These results should therefore not be extrapolated to tibial plateau fractures in general. There are several shortcomings to this study. First, the number of cases in Group 2 is small and the event rate was low. Thus, the study was not sufficiently powered to find actual equivalence between the two groups. Secondly, the presence of osteoporosis of the tibial plateau was not objectively quantified. Thirdly, the addition of a control group involving internal fixation would have been of value. A prospectively designed study comparing internal and circular external fixation of tibial plateau fractures in the elderly could possibly shed further light on the role of circular external fixation in these challenging fractures. Circular external fixation may be a viable treatment option in patients over the age 55 years who sustain high-energy tibial plateau fractures associated with significant soft tissue compromise. No significant difference was found in the union rate or the development of complications when compared to younger patients. All procedures were in accordance with the ethical standards of the responsible committee on human experimentation (institutional and national) and with the Helsinki Declaration of 1975, as revised in 2008. Prior to commencement of the study ethical approval was obtained from relevant ethical review board. Due to the retrospective nature of the analysis informed written consent was not required. Conflict of interest: The authors declare they have no conflicts of interest that are directly or indirectly related to the research.